Planning a wedding can be quite hectic at times, so it can be quite a blessing to find a free wedding text font to unify the look of the invitations. programs, signs, website and thank you cards. It's one less thing for the bride to worry about, and it's also one less thing to pay for. There are enough free wedding text fonts available that prospective brides and grooms should be able to find one that suits the theme of their wedding, as well as their personal style. This is your wedding, and you should be able to use any font you'd like to reflect your personality and the theme of your wedding. However, there are a few font styles that are more traditional for wedding invitations, programs and even for use on a wedding website. The Blessed Day font is available on FontSpace. It's a bold, script-style font that would work well for the heading on an invitation or program, or it can be used to create a logo with the couple's name for a wedding website. The font is cursive, so while it works well for headings and titles, it shouldn't be used in the body of an invitation or program. It's better to use a print-style font for these sections to ensure all guests can read the details of the upcoming nuptials without any confusion. Since the letters are very curvy, it can also be distracting to the eyes to use this font in too many places. Parisish is a font that lends itself to vintage themes, such as a Victorian wedding. The style is simple and easy to read, but creative enough to make printed material look extra special. The letters are a cross between a print-style and some script elements, such as a swirl in the center of the curves of the "B". The font is so simple and easy to read that it can be used anywhere, including on big signs, in headers, and in the body of an invitation. Are you planning a beach-themed or location wedding? Ocean Coastlines font is available for free download from dafont.com. This font has the look of a sign you might see at a beach side resort, and the gentle curves of the letters are reminiscent of ocean waves. The font works best in titles and headings, so use a basic font that is easy to read for the body of your document. This theme conjures up images of knights, castles, and ladies in waiting. Two for Juan can be found at 1001 Free Fonts, and it would work particularly well for a medieval-themed wedding. The filled in, three-dimensional letters have a slight curve to them that is similar to Old English script, but is much easier to read. Accent marks give it an other-worldly look. This font would only work well for titles and headings. It is too large to use effectively in the body of a document. Modern 20 is an excellent font to use for the body of any invitation. It's simple enough that it's easy to read, even in smaller type. However, it can mesh effectively as a header or title as well. The font is a nice replacement for fonts that are more common, such as Times New Roman, and it will give your invitation that special look that shows you took the time to think through your design. It's a simple, Serif font, and it's available from a-zFonts.com. Font Squirrel offers a free font called Italianno. This font would work well on material for a wedding set at a winery or orchard, or for an Italian-themed wedding. It's a decorative, cursive font, so it would work best used in headers and titles because it's easier to read in larger font sizes than smaller ones. For example, Italianno may strain the eyes in 12-point font, but in 20-point font, such as in a heading, it appears clear and pretty. Parisienne is a gorgeous font to use for a French-themed wedding. 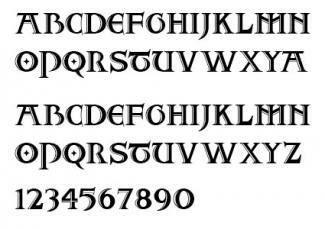 It is available for free download from Fonts2U.com, and it has basic Latin style-lettering. The letters are cursive, and one swirls into the next as though written by someone with perfect penmanship. The font would work well for a formal invitation that was all in cursive, but it could also be used in a heading only. Although the name Lobster might not be a name you'd associate with a good wedding font, this font is perfect for an invitation to a "destination" wedding in a big city. 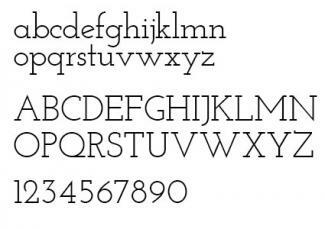 Couples who plan to elope to Las Vegas, yet still want to invite a handful of guests to the wedding, might find this font particularly fitting . It's a bold font that looks a bit like lettering you might see on a neon sign. The letters are outlined, and you can fill in the letters with the color of your choice, such as red or neon pink. This font might also work well for a bachelorette party invitation or bridesmaids and groomsmen thank you cards. Your wedding is big news, so why not use a font like Front Page News to let everyone known when to save the date? The font works well with basic Serif typefaces, and it will even pair well with fonts you likely already have on your computer, such as Arial or Times New Roman. Front Page News could be used for the body of your material, but it is a bold font, so you might want to use it just for titles and headings instead. Josefin Slab is a modern-looking font that would also mesh well with a 1920s theme. It's available for free from Font Squirrel. This is a simple, Serif-style font, but it has a bit more curve to the letters than your typical font of this nature. For example, the "S" and "J" curve perfectly with no angles. This font is easy to read, and it can be used either in titles or in the body of the text. 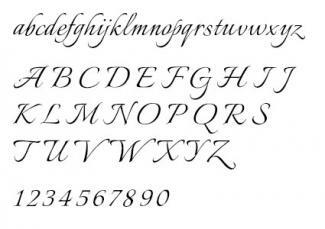 You may want to pair this font with one of the fancier fonts above for an invitation. 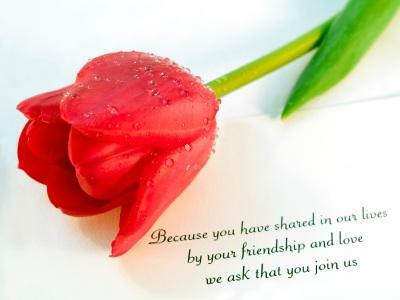 For example, use Ocean Coastlines for headings and Josefin Slab for the body of the invitation. Code 2000 is a TrueType font that can be used in the body of your text. The edges of the letters are accented more than most TrueType fonts that come already installed on your computer, and this will give your wedding invitations a professional look. It can also be used for titles. The larger the size of the font, the more pronounced the edges become on the lettering. Once you find a font you want to use, you'll need to Install it on your computer. This is is as simple as downloading and clicking on the font to install. You may have to download a compression utility if the font is compressed, or "zipped." Extract the font from the downloaded zipped file. Go to Start/Control Panel/Appearance and Personalization/Fonts. Right click in the window pane where the current fonts appear and choose "Paste." Click on "Appearance and Themes." 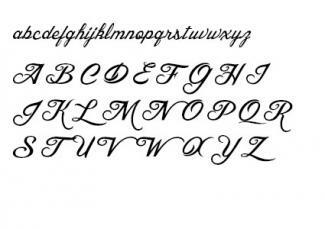 Choosing the right font can help set the mood for a wedding. You should first decide on the style and theme of the wedding, and then search for a font that will support that theme. Stick with just one or two fonts, and try not to mix numerous styles because that can create a busy, cluttered look. Whichever fonts you ultimately choose, just make sure that you are consistent and use the same ones for all of your print and online needs.